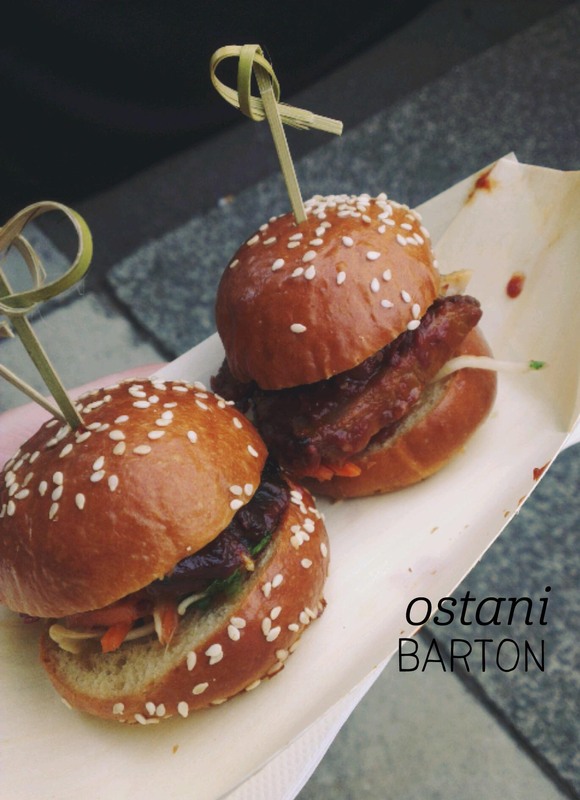 There were a couple of food options at the Night Market at the Realm complex, but my friend and I couldn’t go past the sliders on offer from Ostani. Before the queue got too long, we ordered one of each of the two flavours – BBQ pork and chipotle beef. They were obviously well prepared for churning out food quickly, and we only waited about five minutes before our orders were ready (so fast!). I tried the pork first – it was incredibly tender and really did just melt in your mouth. On my last mouthful I had a lovely hit of corriander, which would have been perfect if it had been throughout. The brioche bun wasn’t overly sweet, but the pork and I want to say char-sui sauce had an overall sweet flavour. The beef was fantastic too, with quite thick chunks and a rich tomatoey sauce. For fast street food, we were very impressed with the quality – two was also just the right amount to leave room for dessert! The market itself was lovely – not overly crowded, with plenty of variety among the stalls and fabulous live music all creating the perfect atmosphere for a summer evening. Sure, the name is odd, but when put in context next to sister store DAS boutique, calling your cafe ‘SAD’ makes some kid of sense. 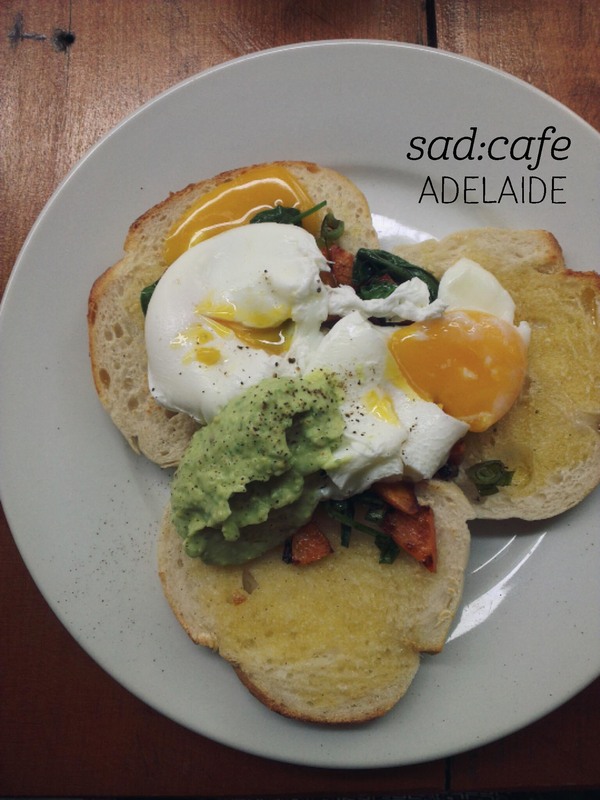 Luckily, this place is anything but sad, located on the revitalised Ebenezer Place that is becoming a bit of a foodie haunt. My friend and I snagged an outdoor table, but I did spend some time admiring the simple decor inside when ordering – pleasant mint-coloured walls, presumably upcycled wooden furniture and cute art in matching frames. I ordered the poached eggs with sweet potato and caper hash, and the iced tea from the specials board. Both came out promptly – the iced tea was served in a jar with a straw and was lovely and refreshing, made from lemon, cinamon, ginger and honey. The eggs were perfectly poached and oozed all over the three lightly toasted buns (heaven). Whilst not what I expected from a hash, the fried sweet potato triangles were lovely, and the avocado hollandaise was a delicious luxury. Surprisingly, the spring onion and capers really brought the dish to life, and there were plenty to include in each mouthful. I definitely left this place perfectly happy. 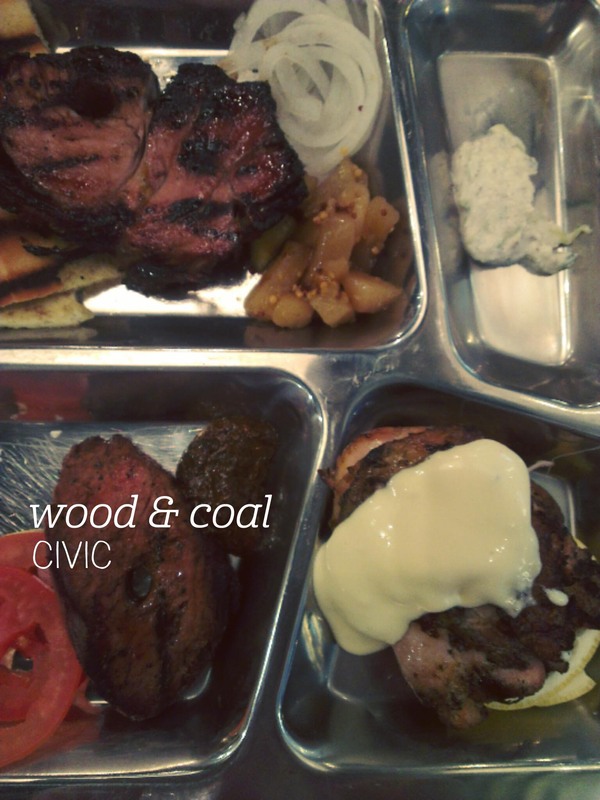 Being owed lunch is a wonderful thing – I’d helped my colleague out a couple of times and was promised lunch in return, so we booked into Wood & Coal. My first impression was positive – the decor is simple but tasteful, with creative tiles on the floor and a ‘balcony’ area that’s inside the mall. 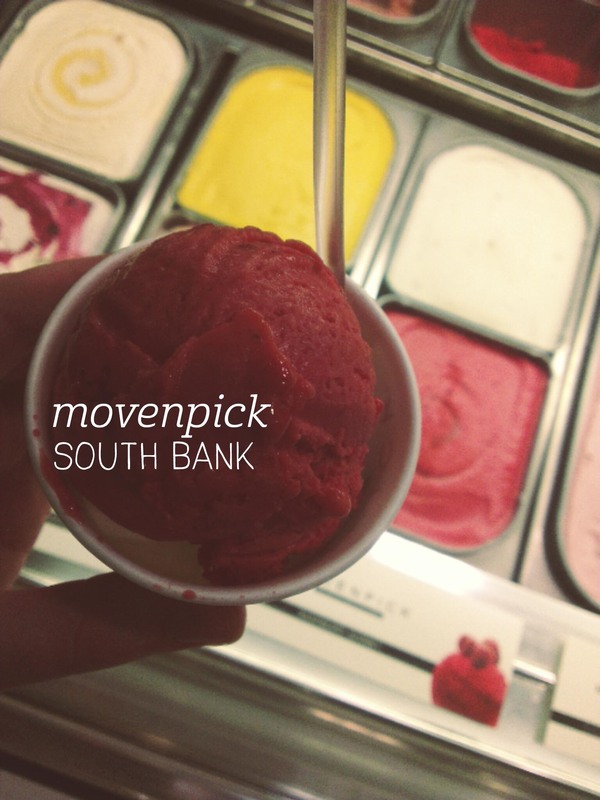 The menu is all about the spit-roasted meats, but there are appetising sides on offer too. We went for the lunch special, which included three different meats, tzatziki with pita bread, iceberg lettuce salad and loukoumades for dessert. So far so good. I was surprised to see that the ‘plate’ was a metal tray with divided sections (like a German bento box, my friend commented) – it seemed a bit down-market for the restaurant’s vibe. But the food removed all thoughts of plates – each meat (pork, lamb and chicken) was beautifully smoky, generously portioned and well accompanied. The pita was soft and although my serving of tzatziki was smaller than the others’ it was rich and tasty. The loukoumades were dense and very sweet – two was definitely just the right amount. We also devoured a side of the fried cauliflower – yum! I’ve been following Exchange’s instagram account for a while and was sucked in by the incredible photos of dounts that they keep posting. Sadly when we went they didn’t have any donuts, but the brunch menu beckoned. 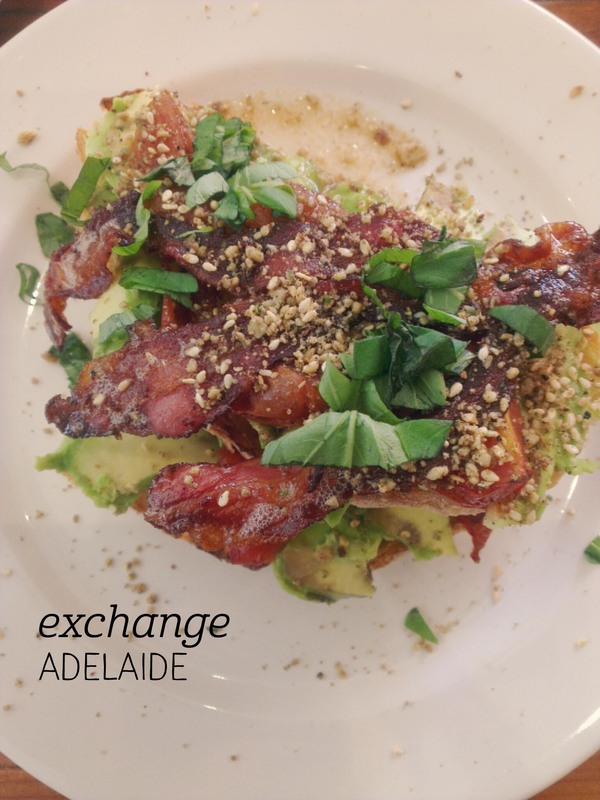 Exchange has a light and airy location off Rundle Street, which is enhanced by its simple decor. Cyclist-friendly, we found a table amongst the lycra-clad patrons and read through the short menu. I started with a local orange juice made in Lobethal (a bit disappointing that they don’t offer fresh juice, but good to support local) and ordered the Gloria plus bacon. 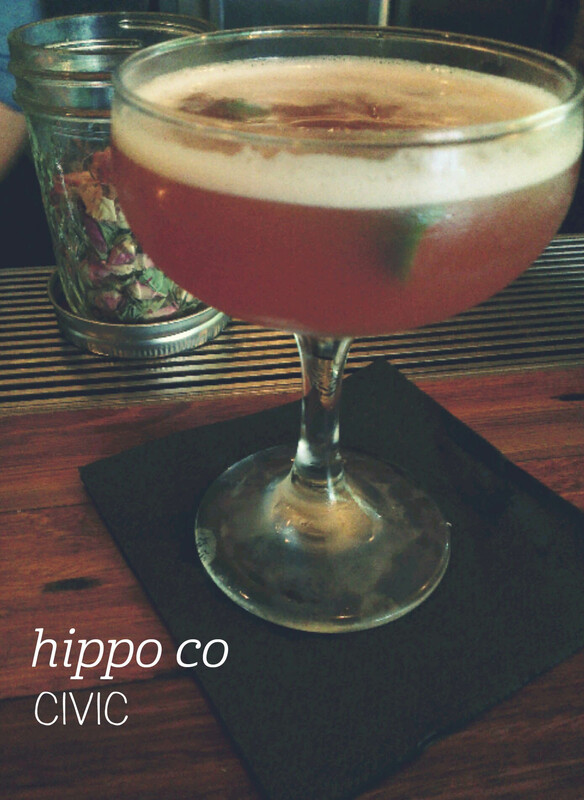 I was impressed by the presentation when it arrived, everything beautifully stacked and dusted in dukkah and basil. The avocado was spread generously on both pieces of the toasted Turkish bread, which was crisp to perfection and topped with rashers of honey-glazed bacon. Mmm. I struggled to finish my dish, as did Mum, who had the fig and hazelnut french toast – also beautifully presented with fresh strawberries and orange segments; I suffered some serious order envy. If you’re in the city stop in at Exchange and have some donuts and/or french toast for me! I raved about Akiba on my lunch excursion, but it seems word hasn’t got out yet that they’re open for breakfast. The menu was very limited – only three food items – but that made the choice an easy one. 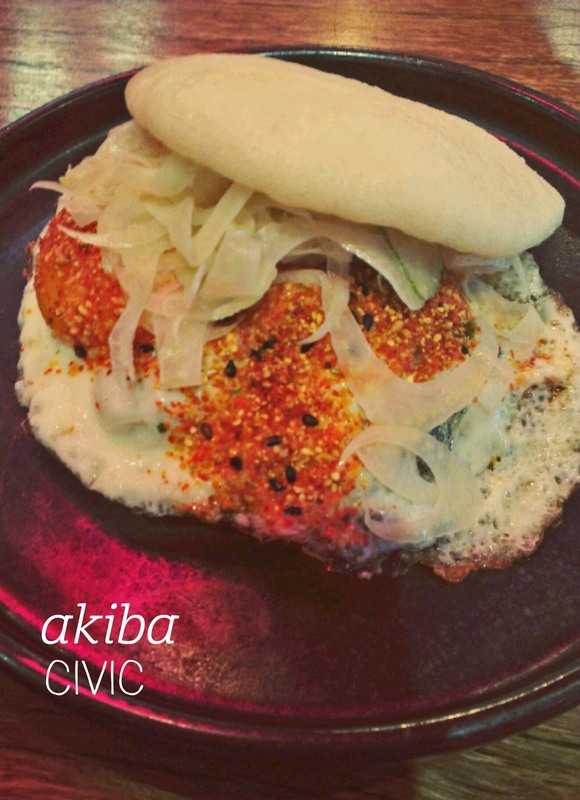 I picked the ‘aki-bun’, a breakfast bao with bacon, egg and pickled fennel. The waiter explained that they’d just set up their juicer to make fresh juice, so I ordered a juice with all of their fruit (you can choose your combination) – orange, apple, pineapple and grapefruit. The food arrived first, and my first impresison was that it was a small meal, which is fine for $6. The yolk of the fried egg was beautifully runny, and there were three strips of lean bacon inside the springy bao. I found the spicy rice seasoning a bit overpowering and quite strong for breakfast, but it did complement the pickled fennel well. Our juices arrived towards the end of the meal (we weren’t charged for them due to the long wait) – I couldn’t taste any pineapple, but the other flavours were clear and fresh. I think having the juice with the meal would have tempered the spiciness, so I’ll be back to try the other two items as they settle into the breakfast service.